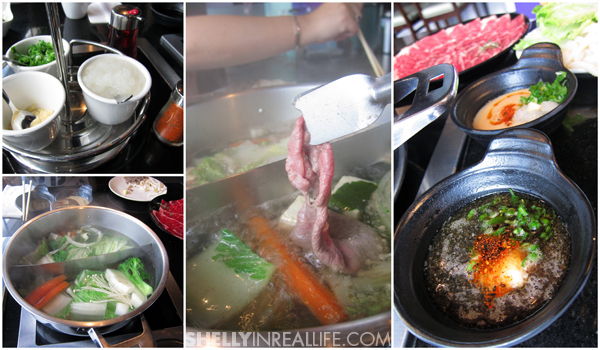 Part 2 of LA Food Tour, as if we didn't already have enough hot pot goodness at Hot Pot Hot Pot, we decided to go to a shabu place in Downtown LA. 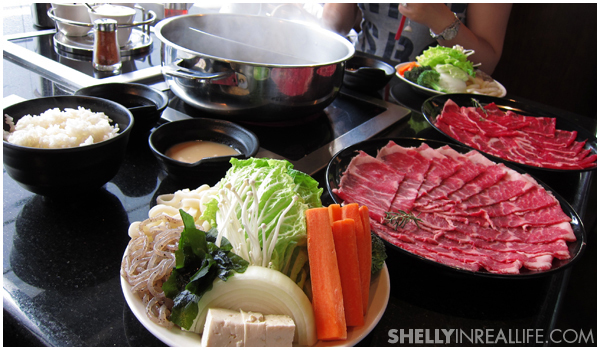 For those of you who don't know, shabu is basically the Japanese version of hot pot, except their broth is just [water + kelp] which = no flavor in the soup (the best part of hot pot in my opinion)! I decided to come here based on one of my friend's recommendation. 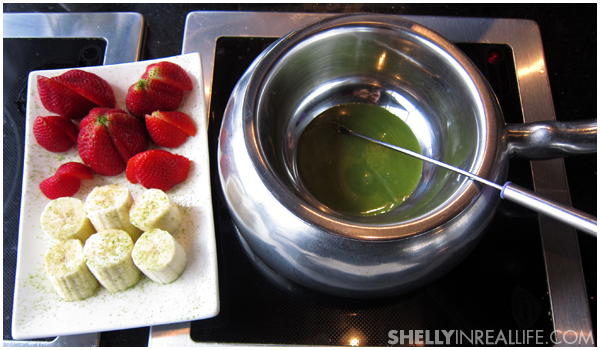 She LOVES the Green Tea Fondue here, so I just had to try it. 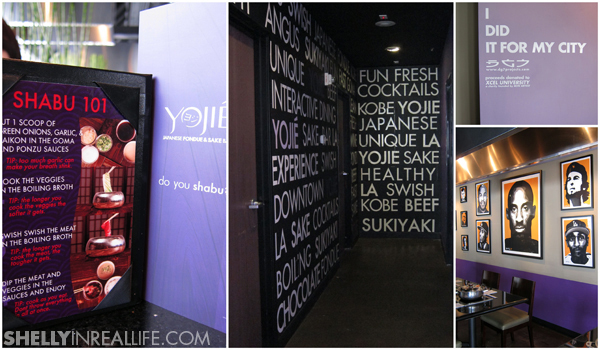 Right away, I noticed the decor - if you didn't remember that you're in LA, if you came into Yojie, you would really remember. They take their Lakers pride very seriously, and I thought it added a nice touch to the overall modern decor. You might notice that the meats in this picture is two different colors. I noticed this right away when the waiter brought out our food and asked about it. I was assured that the quality was the same, but sadly, after doing a quick taste test, I found that this was not the case. It seemed that the meat that was more red, was noticeably more tender and less chewy than the other. Not wanting to waste food, we ate it anyway, but this was definitely a minus for me. If I didn't have the chance to compare, I probably wouldn't have even noticed the lack in quality, but since it was screaming out in front of me...I was unimpressed. If I was sad about the shabu meat, this more than made up for my dissatisfaction. Now I know why my friend keeps talking about Yojie, because this dessert is SO good. 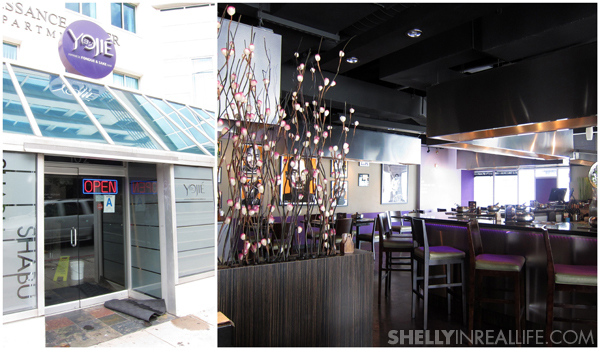 So I will only come back to Yojie for the Green Tea Chocolate Fondue, and probably not the food. P.S. if you spend enough money here, you get free parking right across the street, which is pretty awesome since parking can be a hassle downtown. So that's it! Next up will be my highlights of the trip, Umami Burger and Chego!